There are so many good things to be said about social media. So much inspiration and information out there! There are also some negatives to it as well. Sometimes too much inspiration and information. Is anyone else guilty of losing time on Pinterest or Instagram? I have so much quilting eye candy pinned on there and especially love all the free motion quilting examples. At times it makes me feel both inspired to create more and guilty that I'm not as productive as others. I love seeing all the new fabric coming out, but then that makes me want to go out and buy it. And I already have a room full of beautiful fabric. When I see a quilt someone has made, I start thinking how great that quilt would look in my bedroom or my living room or (fill in the blank) and start planning the fabrics I would make it with. I completely forget the multitude of quilts I'm already working on or have planned. That's one of the reasons I created my quilt binder - to remind me of the projects I have yet to finish/start. It's helped to focus my attention - somewhat. However, I did see one quilt online at the beginning of the year that caught my attention and I couldn't resist it. Nicole of Sister's Choice Quilts made the Triangle Gatherings quilt. This was a year long quilt-along by Lisa Bongean in 2017. I didn't pay much attention to it until I saw Nicole's quilt. She added stars around each of her blocks. 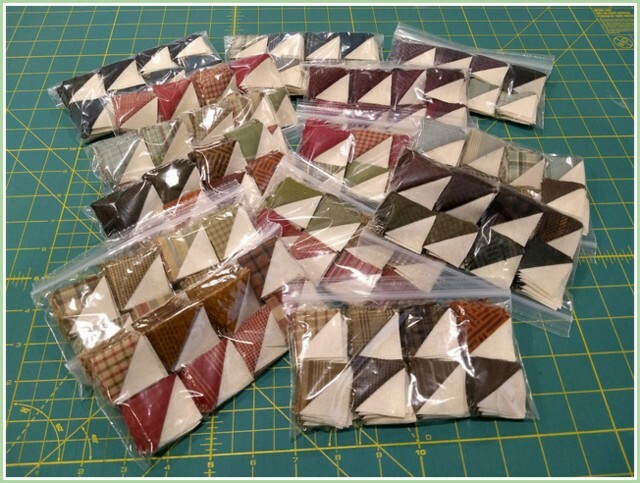 Since then, I've seen several other Triangle Gathering's quilts, each of them set differently, and I've loved them all! 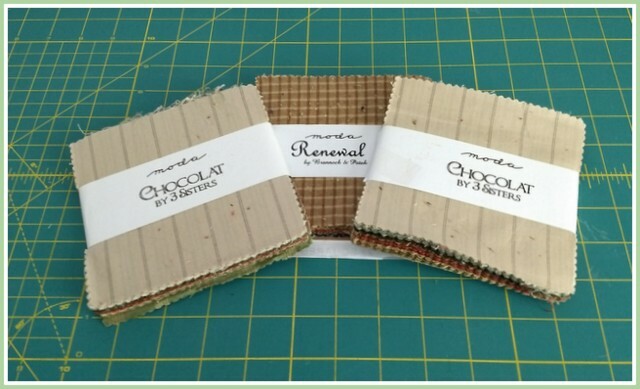 Fortunately I saved off all of the patterns early, because they're no longer available. Apparently, Lisa from Primitive Gatherings is going to release them in a book in the future. I had been hoarding these very old woven charm packs of Chocolat by 3 Sisters and Renewal by Brannock & Patek There are 98 blocks, so I also ended up adding in a charm pack of Wool & Needle Flannels V by Primitive Gatherings. For my background, I'm using a Manilla Grunge. For some crazy reason, I decided on a finished block size of 3 inches. I used Primitive Gatherings Triangle Paper to make all of my HST's. They finish at 3/4" so they're pretty small. 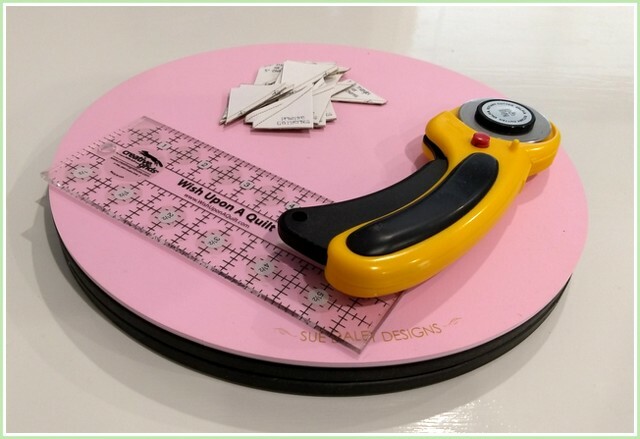 My new rotating cutting mat came in very handy for cutting apart all the papers. It really seems like it should make a bigger pile! Next step is block assembly. As usual, David was there helping me. He made sure I took periodic breaks whether I wanted to or not! 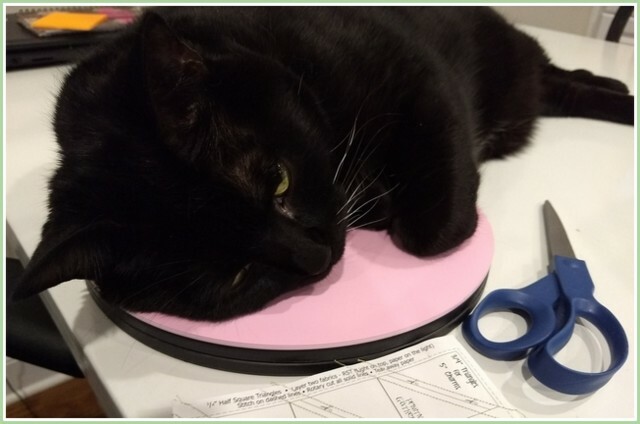 He also gives a 'thumbs' up to the new cutting mat. The content of your blog is exactly what I needed, I like your blog,I sincerely hope that your blog a rapid increase in traffic density,which help promote your blog and we hope that your blog is being updated.